Humanity has wrecked the world. Nuclear war has left much of the earth as a barren wasteland. Humanity still survives, but only in conclaves where those in control lord their power over the common people. Those in power hoard water, gasoline, and bullets, the most important resources in this world, and guard them jealously. Immortan Joe is the leader of one of those conclaves, with a vast store of clean water pumped from deep beneath the earth, and guarded by squads of warboys who are trained to be killers from a young age. Despite these relative riches, what Immortan Joe wants more than anything is healthy offspring, his other children all born with deformities. He keeps a harem of beautiful wives in pursuit of this goal. When his general Imperator Furiosa goes rogue and escapes with his wives in tow, Immortan Joe takes a war party in pursuit, and calls in reinforcements from Gas-Town and Bullet Farm to join in the fight. Mad Max of the title is captured at the beginning of the story and strapped to the front of a pursuit vehicle to act as a blood donor for a sick warboy, to give him the strength to fight. I am only a bit aware of the original Mad Max franchise. When the previews for this movie came out, I thought it looked completely unappealing. I honestly didn’t understand what other people were raving about when they were so excited about it as the movie’s release date approached, and after they saw it in theaters. I wasn’t expecting to see it at any point, so I read some reactions and found them interesting but still didn’t feel compelled to see it. I finally decided I would see it when I heard some reviewers giving the movie a bad review because they thought it was awesome and action-filled but that this concealed a feminist agenda and they were angry that they had been tricked into liking a movie that had a feminist message. I finally rented the movie, expecting it to be pretty much just okay, but really quite enjoyed it. Charlize Theron as Imperator Furiosa was badass, and I hope there are more movies with her in this role. Tom Hardy as the eponymous Mad Max was also solid. Really, great casting all around, and it was really cool to see a woman in one of the lead roles of an action movie where she is an essential part of the action. Probably one of the coolest things about the movie are the vehicle designs. Since most of the movie takes place on the road in pursuit, there is plenty of opportunity for these vehicles to be showcased. They are so much fun just to look at, that I more than once laughed in delight at the absurdity of a design. My particular favorite was the sports car with tank treads driven by the leader of Bullet-Farm. Similarly, costume design and other character design were incredible. It’s… hard to play a flame-throwing electric guitar as serious, but it’s just one example of the over-the-top design that should be stupid, but somehow it all works and ends up being both exciting and hilarious. It had a lot of striking images, sounds, moments. In this bleak, most desperate of landscapes you see the most depraved of the depraved of the most heroic of the heroic. There were heroes to root for, but even those heroes are no pristine blameless creatures, because no such people have survived so long. Rather the heroes are those who want to try to make some small change for the better in the world around them. The movie is basically one long chase scene, full of action, full of surprising and epic and violent moments. I wouldn’t say it’s for everyone, by any means. But I thought it was a really incredible film, despite coming into the movie with reservations. The movie picks up about as many years after the original trilogy as have passed in real life, I suppose. The First Order, the still active remnants of the Empire, is still opposing the New Republic that replaced it. A group of storm troopers of the First Order raids a Resistance camp on the desert planet Jakku, looking for information. Resistance fighter Poe Dameron (Oscar Isaac) hides the vital information in the droid BB-8 and sends it away from the camp before he is captured. One of the stormtroopers known only as FN-2187 (who is later nicknamed Finn) (played by John Boyega) chooses to turn his back on a lifetime of training and chooses not to kill anyone in the raid. Finn helps Poe Dameron escape. Together they meet Rey (Daisy Ridley), a Jakku scavenger and they join forces to get BB-8’s information to the people in the Resistance who need it. I enjoyed this movie. It wasn’t the best movie I’ve ever seen but I enjoyed it from beginning to end and I am glad to see someone has been able to turn around the series after the mess Lucas made of the second trilogy. The special effects were good, and not the fakey CG-looking stuff that was in the second trilogy. The casting of the new characters was solid and it was great to see old faces again. To have a woman and a black man be the main heroes of the story is great to see from a franchise that hasn’t historically had a ton of diversity. It was easy to root for the heroes and easy to boo at the villains. The worldbuilding, set design, costume design all reminded me of the great work of the original. I particularly liked the design of BB-8 whose design is much more broadly practical than R2D2’s. Kylo Ren made a good villain who was sufficiently different than the past villains to not just be a copy but evil enough to be a worthy bad guy. Are there things I could pick apart? Sure. Some of it felt a little over-familiar, but that might have been part of an attempt by the moviemakers to recapture the old audience again. I hope the next movie can perhaps plot its own course a little bit more. And maybe I’ll have some followup spoilery articles where I do so. I don’t see a lot of movies in theater twice, but I might do so for this one so I can watch some scenes more closely. I think, all in all, the franchise was rescued by leaving the hands of Lucas whose artistic tastes have cheapened greatly over the years. I know some people knock Abrams, and I didn’t particularly like his Star Trek reboot, but Star Wars has always been more of an Abrams kind of feel than Star Trek ever was anyway. I enjoyed it, and I think most fans of the franchise will. None of us is a single person. Within each of us are variations of alternate selves that all vie for control in any given situation. We feel like different people depending on the people around us or the setting, and that’s because we can be different people. This movie takes that idea and makes it literal. 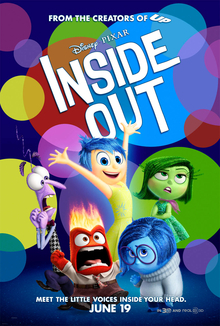 In the world of Inside Out, each of us is basically a machine and our mental space is made of warehouses for memory storage, vaults for the subconscious, and the all-important control room. In each person’s mental control room are five versions of themselves: Joy, Sadness, Fear, Disgust, and Anger. They negotiate to handle the control panel which determines the person’s every action. The outer storyline follows an 11 year old girl named Riley whose family is moving to a different city. Her excitement about the movie is changing to sadness as she misses friends left behind, and has trouble coping with other changes in her life that was going just the way she wanted it. Her parents always want her to be happy and her internal reaction is for Joy to always keep Sadness away from the controls. The conflict between the two emotions sends both of them out of the control room and into the confusing labyrinth that is the rest of the brain. If Joy ever wants Riley to be happy again she has to get herself back to Riley’s control room, and Sadness is along for the ride. This movie was a lot of fun. The casting was great all around, but especially with the casting of Amy Poehler as Riley’s Joy. Most of the structure of the inside interactions within Riley’s head were based on what we understand of human psychology, which made it not just fun but also a pretty apt analogy for the circus we’ve all got going on inside our heads at any given moment. There’s a lot to be examined here: among other things, the importance of the other emotions besides just happiness. Both Riley’s inner story and her outer story are interesting in their own right and are twined together to make an even more satisfying whole. During an American manned mission on Mars, a fierce storm strikes the base camp of the astronauts. One of the astronauts, Mark Watney (played by Matt Damon) is left behind and presumed dead as the rest of the crew aborts the mission and leaves the planet to escape the storm. But Mark is not dead. He is alone on the planet with only enough food to last for a year when the soonest he can expect rescue (if anyone realizes he’s alive to attempt a rescue) won’t be for several years. Determined to live, he sets about the task of survival–cultivating enough food and water to live, and contacting NASA so they can send help. Software engineer Caleb Smith wins a week-long getaway to the home of Nathan Bateman, the reclusive CEO of the tech company where Caleb works. Bateman reveals that he has been working privately on the development of AI and the contest was arranged to get Caleb to his private lab in isolation. The AI is housed in a human-like body with realistic hands and face but with a visibly artificial rest of her body, and she goes by the name Ava. After agreeing to extreme secrecy, Bateman reveals that Caleb has been brought there to determine if she passes the Turing Test, a theoretical experiment in which one examines an AI personality to determine if it can pass for human. I was skeptical of this from the first reveal that it was going to be based around the Turing Test. I am skeptical of the Turing Test as more than a momentary discussionary point because it claims to be a test of intelligence, but it’s really a test of humanity-mimicry. For an artificial intelligence to appear to be truly human would probably mean that it would have to feign irrationality, which is a poor requirement for a testing of an intelligence. 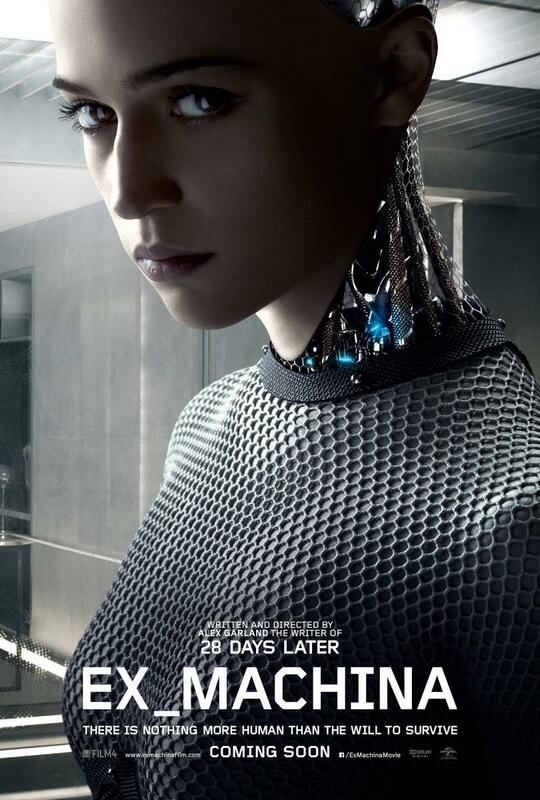 I thought the movie worked pretty well with the flaws in the concept of the test by moving beyond the basic theoretical Turing Test and starting with a later development of the same concept in which the tester already knows the AI is artificially created, but wants to see if the tester can still be convinced emotionally of the being’s humanity despite knowing its humanity is manufactured. This still has the flaw that the thing being tested is human-mimicry and not actual intelligence, but it seemed like the movie was aware of this continued flaw and in the end I thought that by the end I was satisfied that the AI had not just been treated as a human-analog but a separate entity in its own right, which made the movie much more satisfying than I had thought it would be.